No matter how slow the courts of the French Open might be, it seems as though the tournament this year is flying by. We’re already in the second week of Roland Garros tennis and we’re staring straight down the barrel of the men’s quarterfinals. The first week was chock-full of losses and winners, some were surprising and some were downright confusing. The French Open has already dismissed all Americans (men and women singles), many of the top seeds have fallen, and there was even one guy who proved the term “lucky loser”. 1. Novak Djokovic  vs. Jo-Wilfried Tsonga : This first quarterfinal is going to be particularly juicy because they are tied 5 all in their meetings. Even though, Nole is world #1, that doesn’t mean the Frenchman won’t have a good chance of taking the Serb the distance and taking home the W. There are plenty of factors in this match up, though I think the most important one, and probably the most influential part of it is the crowd. Tsonga is the hometown favorite, that goes without say, so I do believe that the energy the crowd adds to the atmosphere will fule Tsongas’ purpose on Court Philippe Chatrier. However, Novak is coming off a two major title winning streak (2011 US Open and 2012 Australian Open), so the momentum is definitely on his side of the court. Digging a little deeper, for Tsonga to pull out the win, he’s going to have to play some very smart tennis. Djokovic is very strong and anticipates well in big matches, so Tsonga will have to construct points wisely. He cannot make lousy shots right at Nole, Tsonga will have to play corner to corner, moving Djokovic around, staying unpredictable. Tsonga should make good use of the dropshot, he’s actually quite good at it too, dropshot then lob over Djokovic. For Djokovic to win, he’s going to have to serve well and make the most of the short balls that are bound to come over to his side of the court. Like Tsonga, Djokovic will have to be smart and use the entire tennis court to move the Frenchman around. It’s not going to be easy by any mean, especially when the crowd will more than likely be against him. Nole will have to remain calm and make absolutely sure he doesn’t do anything stupid that will turn the crowd on him (memories of 2008 US Open come to mind). I predict that Novak Djokovic will win this match up, probably in 5 grueling sets. 2. Roger Federer  vs. Juan Martin Del Potro : This is already looking to be the match of the French Open! We have Federer looking to capture another major title and one step closer to regaining the world #1 spot. Then there’s Del Potro, the Argentine who is looking to get himself back in the saddle as a contender to win many majors. It’s going to be hard to call this one, Federer has already had a pretty dull tournament nearly getting bumped out a couple of times. Federer is going to have to work hard for this match, he’s going to have to move Delpo around quite a bit, especially since his knee seems to be bothering him. Roger is also going to have to do what he’s not the best at, grind. Federer is the type of player to keeps points short so he’s going to have to keep away from extended rallies from the start. He should also consider placing his ball deeper in the court, near the baseline with less spin, essentially not letting the ball bounce up near the hips of Juan Martin. Delpo will absolutely crush anything that is in his wheelhouse, we’ve already seen it at the 2009 US Open where Delpo was ripping 100+ mph forehand winners against Roger. If Federer keeps the ball low and fast, his chances are pretty good. 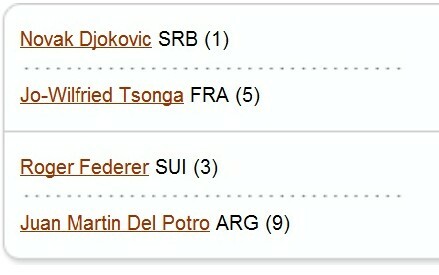 If Juan Martin Del Potro wants to knock out Federer in this quarterfinal, he’s going to have to hit big…really big! Delpo has to get himself in position to attack on any balls that are sent his way that will give the opportunity to crush. Federer doesn’t handle pace as much anymore, so that’s is going to have to be the tactic for Juan Martin. There is a problem with being able to hit through the court with a lot of pace, the clay courts at Roland Garros are incredibly slow; this will make Delpo’s big groundstokes less effective. JMDP is going to have to attack when he can and try to hit to Federer’s weaker side, the backhand, hard strokes to Federer’s backhand is going to earn the Argentine many easy points. Obviously, both players will have to serve well, though I think it’s going to be more crucial for Federer as he was hovering around the 60% service mark. That’s not going to work very well against a tall, powerful player like Del Potro. One more factor will be, I believe the French crowd will be pulling for Federer; Delpo can’t let this get to him, it’s a big match no doubt, so he should stick to his guns and outhit Federer. I’m really torn with this match up, I really want both players to win, but it can’t be; I sincerely want Roger to get one step closer to capturing another major in his career, though I also want Delpo to make it to the next round. It’s a tough decision, though I predict that Roger Federer will win over Juan Martin Del Potro in five sets. Be sure to check back tomorrow for my predictions of the second round of the quarterfinals where I will make the calls for the Murray vs. Ferrer and Nadal vs. Nicola Almagro!